Jason Hartman interviews real estate broker, Tay Oz about what is making the Dominican Republic more and more attractive to foreigners. Tay says the D.R. 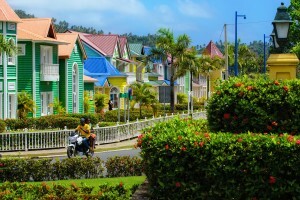 is the least expensive in the Caribbean, with temporary and permanent residency much easier to obtain. The cost of living is even more affordable than America, with a slower paced lifestyle. Tay shares that many Americans are expatriating or investing in the Dominican Republic because they’re fed up with the political climate in the United States and tired of working to live. Jason and Tay also talk about the business and investment climate, which is currently thriving with retirees and expats moving to the D.R. As the main broker of Property Center in the Dominican Republic, Tay Oz has assisted countless individuals and families in re-location to the north coast, handling all aspects from real estate purchase to assistance in recommendations for lawyers for residency purposes, etc. Property Center has been active in the real estate industry in the Dominican Republic since 2002, assisting clients from all over the world in purchasing vacation, investment and permanent re-location properties. Tay obtained his real estate license with INFI in 2004. He has been living in the D.R. since 1999 and has immersed himself in the local real estate market and is a well respected team leader.